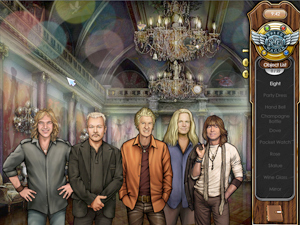 Legendary rock band, REO Speedwagon, has released a first-of-its-kind video game product aimed at the worldwide audience of “casual gamers.” Estimated to be nearly 200 million consumers, casual gamers are primarily adults over 30, more than half of them women – a demographic that overlaps well with the REO Speedwagon audience. In Find Your Own Way Home, the player is the protagonist in a story that unfolds across dozens of game levels for several hours of entertainment. The game is designed to appeal to both the typical gamer, and the dedicated REO Speedwagon fan. For music fans, the game introduces new ways to interact with music; and for the typical gamer, it brings several innovative game features to the category – in particular bridges between the game experience and the real world. As players reach certain milestones in the game they earn prizes. For example, the product features an exclusive release of REO Speedwagon’s new re-recording of their classic, Roll With the Changes, a single from their brand new album, “Not So Silent Night – Christmas with REO Speedwagon,” and a well-hidden “Golden Ticket,” which, when found by the player makes them eligible to win concert tickets and a backstage meet-and-greet with the band. “Find Your Own Way Home” is unlike fast-paced action video games such as Guitar Hero or Rock Band. This game uses the popular “hidden object mystery game” model to deliver the music of REO Speedwagon to a huge global gaming audience. The game is being distributed globally, in five languages, first as an online product via dozens of “game portals,” then likely, to be put on a disk and packaged for retail distribution. In the game the player is an entertainment reporter who has been on assignment with REO Speedwagon as they’ve been finishing their new album. The game takes place on the day the new album is to be released at a fantastic release party. But something goes wrong, when Cronin goes missing, and it’s up to the player to locate the missing star. Everyone who buys the game will get a discount coupon to purchase REO’s new album, Not So Silent Night – Christmas with REO Speedwagon. Hidden deep within the game are “Golden Tickets.” Players who find a Golden Ticket will be eligible to win two real tickets to a real REO Speedwagon concert, and a backstage meet-and-greet with the band. The game launched along-side other REO Speedwagon’s recently released new Christmas album, Not So Silent Night Christmas with REO Speedwagon, on Sony Legacy Recordings, produced by Joe Vannelli, with associate producer and lead singer Kevin Cronin. The album features 13 Christmas classics with a unique REO Speedwagon musical twist.